The youth of Watertown are less likely to drugs, alcohol and tobacco than in the prior years, according to the results of the most recent results of the latest Youth Risk Behavior Survey. Members of the Watertown Youth Coalition discussed the findings from the 2017 Youth Risk Behavior Survey at a recent School Committee meeting. The group also held a town hall meeting to discuss the survey results in April. The survey also tracked depression, suicidal thoughts and bullying. Stephanie Sutherland-Ramsey, Program Coordinator for the Watertown Youth Coalition at Wayside Multi-Service Center, said that the downward trend of the use of tobacco, alcohol and drugs continued in this survey. There was a slight increase in the previous survey in 2014 for alcohol and marijuana use. The survey includes the responses of 563 middle school students and 538 high schoolers. In high school, less that 20 percent of students reported ever smoking or using other tobacco products, and less that one percent are daily users. In 2009, just over 40 percent said the smoked at least once and over 15 percent smoked every day. High schools students who ever drank alcohol use dropped from 65 percent in 2009 to 55 percent in 2017. The percent of daily drinkers has gone from 32 percent to 13 percent over the same time. Thirty percent of Watertown High School students said they have tried marijuana in the 2017 survey, which is down from 41.5 percent in 2014, and 40.8 percent in 2009. Regular users have dropped from nearly 9 percent to under 2 percent from 2009 to 2017. Misuse of prescription stimulants or pain relievers has dropped from nearly 10 percent for both in 2014 to less that 5 percent for stimulants and less than 4 percent for pain relievers in 2017. The survey also tracks the perception of how harmful students believe different substances are to them. After the perception of marijuana use being harmful dropped the previous two studies, to 37.5 percent in 2014, the proportion of students in 2017 who thought it was harmful increased to 52.1 percent. Over 75 percent of students believed that binge drinking (5 or more drinks in one sitting) is harmful, the 2017 survey found (compared to under 70 percent in 2014). However, the percent who thought that smoking a pack of cigarettes or more daily is harmful dropped from 85 percent in 2014 to 78 percent in 2017. The rates of substance use by students identifying as heterosexual was similar to those identifying as LGBTQ (lesbian, gay, bisexual, trans, questioning), but the survey showed trends. “In all cases (substances) the LGBTQ students use the substance more than students who identify as heterosexual,” Sutherland-Ramsey said. More than a quarter of Watertown High School students reported feeling depression at some point, with the rate dropping form 27 to 26 percent from 2014 to 2017. The rates of students who considered suicide, made a plan or actually attempted suicide dropped more steeply. In 2014, 14 percent of WHS students said they considered suicide, and three years later the rate was under 11 percent. In the 2014 survey, just over 11 percent said they made a plan to commit suicide, while in 2017 under 7 percent reported doing so. The percent of students who reported making a suicide attempt dropped from 7 percent to under 4 percent from 2014 to 2017. The 2017 high school numbers represent: 136 students reporting depression almost every day for two weeks, 56 students who seriously considered suicide during the past year, 34 percent who made a suicide plan over the past year, and 19 students who ever attempted suicide. At Watertown Middle School the rates were under 15 percent for depression (79 students), under 9 percent seriously considered suicide (46 students), under 8 percent made a suicide plan (41 students), and 4 percent attempted suicide (21 students). The survey also asked students about how much screen time they had (television, computer, smartphones, etc.) besides using it for schoolwork. The percent of students who have 5 or more hours of screen time went from 7 percent for sixth graders to more than 14 percent for 12th graders. The survey also found that students with more screen time were more likely to say they had feelings of stress/anxiety and depression. School Committee member Lily Rayman-Read noted that this does not prove cause and effect. “It is not saying that more screen time causes stress and depression, but there is a correlation,” Rayman-Read said. The percent of students at the high school who reported being bullied over the last year was just over 15 percent, with equal amount by gender. At the middle school, more than 24 percent said they had been bullied in the last year, with nearly 32 percent of girls saying they had been bullied and under 17 percent of boys. At both schools, the percent of students who said if they saw a bullying incident they told someone about it went up from previous years, with 80 percent of middle school students (up from 75 percent) and 74 percent of high school students (up from 63 percent) reporting bullying. 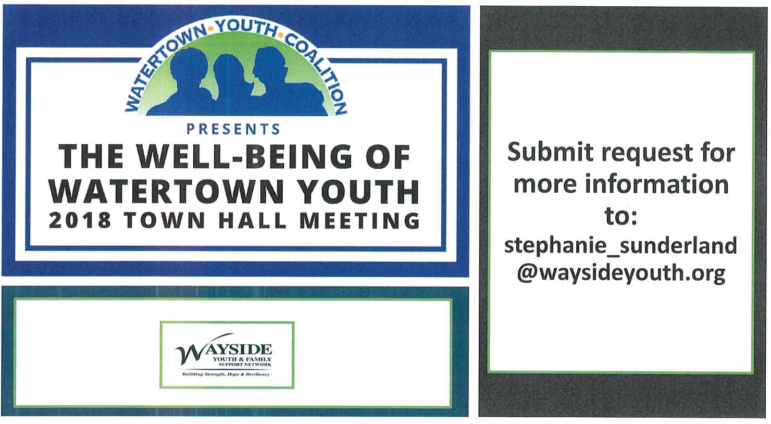 See the Watertown Youth Coalition’s presentation slides by clicking here. A summary of the discussion of the Well Being of Watertown Youth: Town Hall Meeting 2018, held at the Watertown Library on April 11, 2018, can be found here.